In my previous blog I wrote about the setup and configuration of LoginPi. I promised to write a second blog that would cover the dashboards, that blog is here. First let me give you some links to more information about LoginPi. There was a Podcast last week where LoginPi was addressed. With all this information you can get a good picture of the capabilities of the product and value it for yourself. The Podcast is found here. My previous blog is found here. The product documentation of LoginPi is found here. So after reading all that and listening to the Podcast you wonder what the dashboard really look like, right. After the launcher and the engine are finished doing the logon and starting the applications, you will see the data in the dashboards. The console has two option there, one being the dashboard and one being the graphs. First we look at the dashboard. I chose the standard Windows applications to be used in the testing and therefore you see standard applications like Paint, wordpad, Calculator and Notepad there. There is another option to select Office applications but for the sake of testing this will do just fine. The dashboard will show the most recent results only, for more granular charts you have to go to the charts. What you see in the dashboard is the start time of these applications in a number of tests. I did four tests before I cancelled the test and focused on the dashboard. You can see how the starttime of the application changes with every test. You can also see why this would be helpful in your own environment. 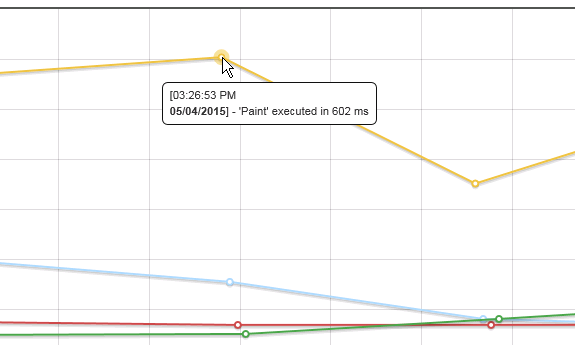 When you zoom in on the dots you see the time it took to execute the application in that instance. Every dot is hover able and you see the time for that specific test. The other dashboard shows the logon times of the tests, every time a logon is initiated it is logged here. In your environment you would like to see a horizontal line more or less, to much differences means that your users also experience them. If you hover over a dot, a metric on the line you see the time it took to log on. My lab is not the fastest lab around so it took 41 seconds at one time but only 20 second one test earlier. When you browse to the charts you first have to select the From date and the End data, also the time between you want to see the results is select-able. If you have an issue in your environment you can drill down and see what the test was showing there. Another option is to select the job you want to see in the charts. Here I had only one job, the Storefront XenApp job. If we go to the charts option in the console we see each application in a bar and the averages of these applications are shown. The view is a bit wrong due to logon times also being displayed in the same view as the applications. I for one would make an option to add or remove that metric from the screen. If you hover over the application again you see the time it took to start Notepad, its an average over all the test. In your production environment you would test your environment every half hour or so, so the averages after a day with be for 16 instances. Another screen you see again at the charts is the logon metric, the difference between the charts and the dashboard is that you can select a start and end data. Again as shown before you can hover over the dots to get results or guess by reading the left bar. The last chart is the dotted chart where you see all the application colored as a dot in the dashboard. Again if you selected a certain period of time you will be able to drill down to that and see the specifics. If you hover over the dots you will see the time it took to execute the application. You can see how long your application took to start in that occasion. If you look at the alert screen you will see the history of the jobs started. If will show you if all the jobs have started successfully, I experienced some issues and was able to fix them with the help of Login. I think LoginPi have created a nifty product that certainly has a market, companies are looking for ways to test their environment and don’t really care for expensive and difficult to implement solutions. LoginPi is a simple way to test your environment without the need to create application profiles and so on. I think it will do for many companies that just want to see what the logon time is and how defaults applications are started. One addition would be to see a break down of the logon time in how logon each step took.